The eponymous ancestor of the Hebrews; grandson of Arphaxad and great-grandson of Shem; father of Joktan, the ancestor of the Arabs, and of Peleg, among whose progeny, in the fifth generation, was Abram (Gen. x. 22, 25-30; xi. 18-26). The word "Eber" signifies "the region beyond." Of the nine words in Genesis that designate Shem's descendants, at least two, "Arphaxad" and "Serug" (Gen. xi. 10, 21), are identical with the names of districts: the former indicating the district of Arrapachitis on the upper Zab, the latter the place where Abu Zaid of "Saruj," the hero of Ḥariri's "Maḳamat," had his home. The conclusion is therefore warranted that the term "Eber" originally designated a district. The use of "Eber" as a "nomen appellativum" is common; it denotes originally "that which is beyond." 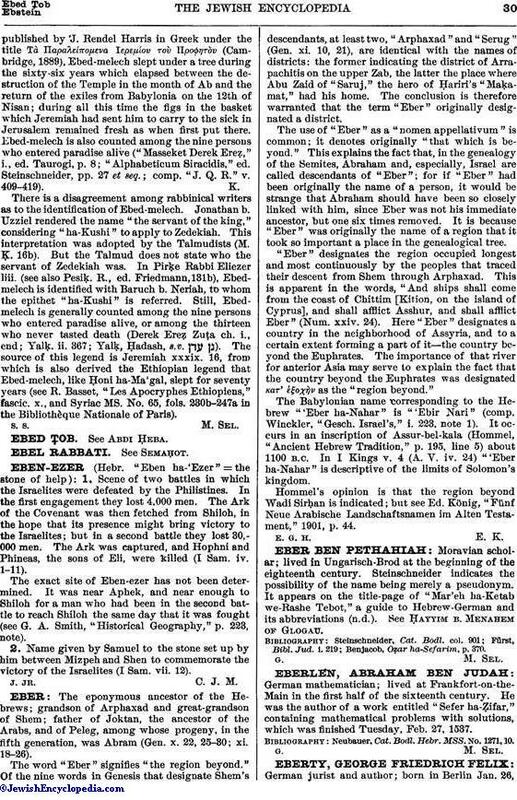 This explains the fact that, in the genealogy of the Semites, Abraham and, especially, Israel are called descendants of "Eber"; for if "Eber" had been originally the name of a person, it would be strange that Abraham should have been so closely linked with him, since Eber was not his immediate ancestor, but one six times removed. It is because "Eber" was originally the name of a region that it took so important a place in the genealogical tree. "Eber" designates the region occupied longest and most continuously by the peoples that traced their descent from Shem through Arphaxad. This is apparent in the words, "And ships shall come from the coast of Chittim [Kition, on the island of Cyprus], and shall afflict Asshur, and shall afflict Eber" (Num. xxiv. 24). Here "Eber" designates a country in the neighborhood of Assyria, and to a certain extent forming a part of it—the country beyond the Euphrates. The importance of that river for anterior Asia may serve to explain the fact that the country beyond the Euphrates was designated κατ' ἐξοχὴν as the "region beyond." The Babylonian name corresponding to the Hebrew "'Eber ha-Nahar" is "'Ebir Nari" (comp. Winckler, "Gesch. Israel's," i. 223, note 1). It occurs in an inscription of Assur-bel-kala (Hommel, "Ancient Hebrew Tradition," p. 195, line 5) about 1100 B.C. In I Kings v. 4 (A. V. iv. 24) "'Eber ha-Nahar" is descriptive of the limits of Solomon's kingdom. Hommel's opinion is that the region beyond Wadi Sirḥan is indicated; but see Ed. König, "Fünf Neue Arabische Landschaftsnamen im Alten Testament," 1901, p. 44.